LONDON — Top officials of the European Union, exasperated by the chaos and dysfunction of British politics, indicated on Wednesday that they were willing to grant a short delay in the deadline for Britain’s departure, but only if Parliament approved an unpopular withdrawal plan that it has twice rejected by huge margins. Their position suggested that the showdown between Britain and the European Union is destined to go right down to the wire, with the outcome remaining unclear virtually to the final days before the March 29 deadline. The intervention appeared calculated to pressure British lawmakers to fall into line or risk an outcome they like even less, like a no-deal Brexit or a lengthy delay leading potentially to no withdrawal from the bloc at all. But it remained unclear how the contradictions that have bedeviled British politics could be reconciled only barely a week before Britain’s scheduled departure. The president of the European Council, Donald Tusk, did offer a bit of encouragement in an otherwise bleak landscape. A day of confusion began with Mrs. May formally requesting a short delay to Britain’s departure from the European Union after a bitter dispute in her cabinet over her plan for a lengthier extension. The deadlock in the cabinet underscored the political crisis gripping the government. Even Mrs. May’s spokesman acknowledged as much, saying the prime minister had warned that this could happen if her Brexit plan were rejected. In a letter to European Union leaders, Mrs. May asked for an extension to the negotiating process until June 30, raising the prospect that Britain could still suffer a disorderly departure in the summer. Reflecting that possibility, the British pound dropped on the news. In response, Mr. Tusk said a delay was possible but “but it will be conditional on a positive vote on the withdrawal agreement in the House of Commons.” That seemed calculated to help Mrs. May, by pressuring her critics to support her plan to avoid a disorderly, possibly chaotic, rupture that many British lawmakers fear. Mr. Tusk pointedly avoided saying what would happen if Parliament rejects Mrs. May’s plan again, though he said he would be willing to call a fresh meeting of European Union leaders next week, if necessary. The prospect of any delay to Brexit is a broad and humiliating reversal for Mrs. May. It is sure to infuriate many members of her Conservative Party, most of whom support leaving the European Union with no deal if necessary, and to reaffirm the cynicism, rampant among many of the 17.4 million Britons who voted to leave, that the elites in London would never let them have their way. Mrs. May’s decision was sharply criticized by the opposition Labour Party and by some of her own lawmakers. Limiting the request to a short delay is the latest in a series of political gyrations from Mrs. May. Last week she said that, if Parliament failed to vote swiftly for her plans — which have been rejected twice — then Britain would face a lengthy delay and have to take part in European elections in May. It was that prospect that set off a rebellion from Brexit supporters in her cabinet on Tuesday — and reports of resignation threats — that appear to have prompted another retreat. 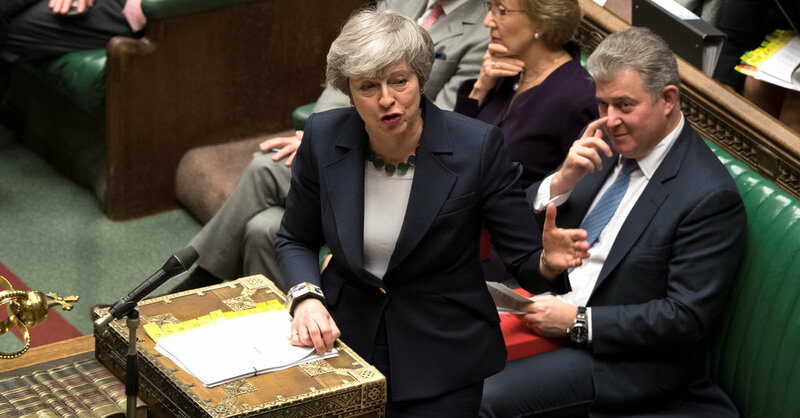 “As prime minister, I am not prepared to delay Brexit any further than 30 June,” Mrs. May told lawmakers on Wednesday, prompting some speculation that she might resign if Parliament tried to force a longer extension. A short delay will keep alive hopes among hard-line Brexit supporters in Parliament, who want to leave without any agreement, and they will be under little pressure now to approve Mrs. May’s deal. Since becoming prime minister in 2016, Mrs. May has had one overriding objective: to extricate Britain from the bloc while maintaining the unity of her Conservative Party. She has largely failed in that mission, and the underlying political problem for Mrs. May remains unresolved. There is no majority in Parliament for any approach other than a “soft” Brexit, with Britain staying in the bloc’s customs union and close to its single market. But that would require cross-party cooperation and would surely rip apart her party. On the other hand, if a hard-liner like the former foreign secretary, Boris Johnson, should supplant Mrs. May, that would just as surely prompt widespread resignations and defections among pro-European Conservatives. European Union leaders are unlikely to rebuff Mrs. May completely — a no-deal Brexit would hit Continental economies, too, if not as severely as Britain’s. But their patience is being sorely tested. Mrs. May is likely to try to return to Parliament next week and stage another vote on her deal. Nothing if not stubborn, she is not giving up on her unpopular blueprint for Brexit. Indeed, she excels at buying more time, and a delay would give her at least a couple of more weeks to resolve the crisis. Like most everything else with Brexit, the process of requesting and granting an extension is no simple matter, which helps explain why it created such bitter divisions in the cabinet on Tuesday. For legal reasons, a delay beyond the end of June would be likely to require Britain to participate in elections to the next European Parliament, making a mockery of British plans to leave the bloc. But as another legal matter, a decision on whether to stage the elections — and effectively to go for a longer delay — must be made during the second week of April. The Brexiteers want to use the upcoming European elections as a sort of backstop, to borrow a phrase, to force Britain to leave, since it would be legally problematic to remain in the bloc without representatives in the European Parliament. If a long delay would be awkward for Britain, it is not straightforward for the European Union either. It would mean the British enjoy the full rights of membership despite their efforts to leave the club. In that event, European officials are concerned that Britain might try to use its power to paralyze the bloc’s other business as leverage to extract more concessions on its exit deal.